The world's first kustom kulture magazine about hot rods and rock and roll, est. 1993. 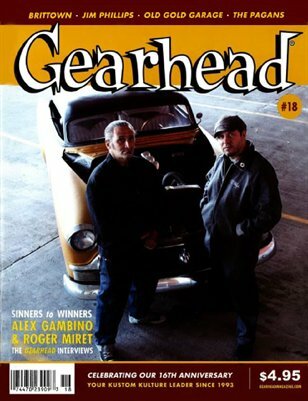 This issue features stories and interviews with Roger Miret from Agnostic Front, Gambino Kustoms owner Alex Gambino, skateboard artist Jim Phillips, Old Gold Garage, Brittown, and Mike Hudson of The Pagans. Also includes articles on the Beatniks car club down under, A-Bombers Weekend, Krash & Burn, plus all the regular columns!